It is an article of faith for many on the British Left that measures to combat left wing antisemitism are in reality measures to combat Labour Party leader Jeremy Corbyn: attempts promoted by the fiendish ‘Israel Lobby’, and opposed by Jews. Yes, by Jews. You know the Jews I mean: maybe not the Jews you’ve actually met, but, as Chaminda Jayanetti put it, ‘the Good Jew[s] – the Perfect Jew[s]. The Manic Pixie Dream Jew[s]. The Jew[s] to be put on a placard as evidence of how Not All Jews support Israel.’ There’s a certain kind of Leftist who needs those Jews. Nick: Angela’s in Hackney. Are there problems regarding antisemitism in the Labour Party in your view? Good morning. Angela: — is a lobby group. Nick: Excuse me, you’ve got the CAA as well. Angela: Another Israel lobby group, you see all your calls so far, it’s all Israel, Israel. Nick: Okay, okay. Wes Streeting, then. Angela: I don’t know what Wes Streeting’s agenda is, but I can tell you that up and down the country, there are Jewish activists working for Labour to get into power, and they support Jeremy Corbyn, and they’re not playing the antisemitism, the the argument with the Jewish Labour Movement and the Campaign Against Antisemitism, their aim is to get rid of Jeremy Corbyn by any means and this uhm witch hunt that they’re pushing in the Labour Party about claims of antisemitism is all focused around Israel. Nick: What, what — I don’t understand what’s in it for Wes Streeting, just if I bring someone else into the conversation — what’s in it for him? Angela: You have to ask him! Angela: I’ve no idea! Maybe he’s part of the Israel Lobby, I don’t know. We have here two tropes, or rhetorical devices, that are commonly mobilised to rebut allegations of antisemitism: on the one hand, what David Hirsh has called the Livingstone Formulation — i.e. the implication that any complaint about antisemitism is in reality no more than a cloak-and-dagger attempt to protect Israel by hurting those who support Palestinians — and on the other hand, the conscription to one’s aid of an unseen multitude of Jews who say that other Jews are wrong. Still. Might not the assertion that there are ‘so many Jewish people’ who support Corbyn ‘up and down the country’ be literally true? It won’t necessarily help Angela’s case if it is, because opposing antisemitism and supporting Jeremy Corbyn are not mutually exclusive: with the exception of a very vocal segment of its activist base and some decidedly odd pressure groups such as Labour Party Marxists and the (anti-Zionist) Jewish Voice for Labour, the party largely came together around the JLM’s proposed rules changes, with support not only from Corbyn himself but also from the powerful pro-Corbyn organisation, Momentum. But I still think it’s worth trying to find out. How can we do that? We can’t just ask people we know, because that will give us a biased sample (especially if we move in circles where people who don’t question Israel’s right to exist are routinely made to feel uncomfortable). Election results give us a clue, though it’s hard to pick out the signal from the noise. 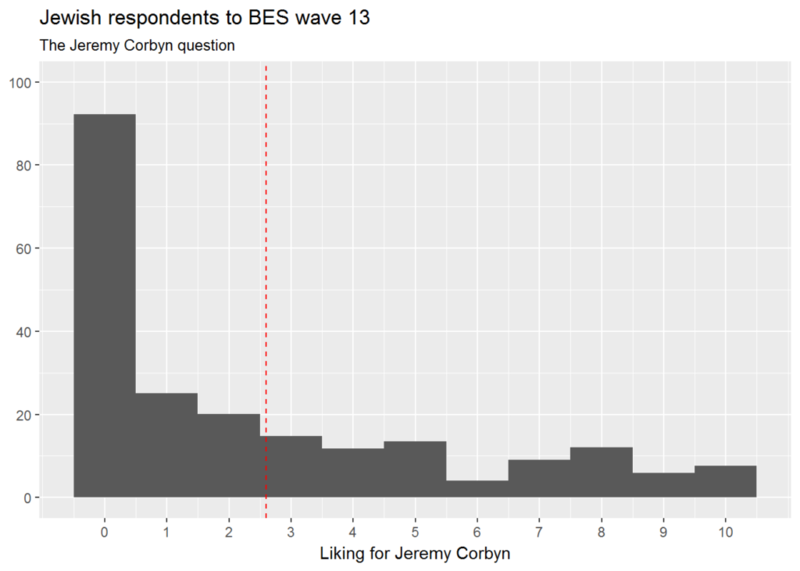 So, for a more reliable picture, we should take a look at the most recent wave of the British Election Study: a very large random sample survey that took place just after the General Election this June. Well, that’s pretty stark. It looks as if Jews were less enthusiastically pro-Corbyn than members of any other religious group. The UK’s Jewish population is approximately 270000. Thus, we can assume that there were something in the region of 46000 British Jews who were somewhat positively disposed towards Jeremy Corbyn this June. That is not an inconsiderable number — but it is a clear minority of British Jews, and non-Jews have no right to forget about the rest. So much for relative levels of like and dislike. What about the extremes? After weighting, only 3.3% of Jewish survey respondents gave him a 10, while 40.6% gave him a 0. This means that we should assume that something like 9000 British Jews really, really liked him — while 110000 (or roughly 12 times as many) really, really didn’t. Oh, Labour — you can still, I think, be fixed, if you really want to be. But first, your leader will have to admit that a serious problem has (to put it rather charitably) emerged on his watch — and in his big speech on Wednesday, he didn’t even mention it. (Perhaps unsurprisingly, given past attempts to whitewash the problem.) One recent study unsurprisingly found that people with strong anti-Israel attitudes and beliefs (of whom there are many in the Labour Party, especially among Jeremy Corbyn’s supporters) tend also to hold antisemitic beliefs about Jewish people, while another found eight times more antisemitism among Labour Party officials than among representatives of any other British party. Tackling that is going to take more than just a rules change. And conjuring up imaginary (Jewish) friends really isn’t going to help.